Fry, sear, scramble, and saute all of your signature dishes in this versatile 8" aluminum fry pan! With a shallow, curved wall design, this pan allows for easy stirring and prevents steam from forming in the pan. These 8' fry pan is perfect for small cooking. We use them to cook small side dishes. They are a perfect fit for our small kitchen. We will continue to purchase them as needed. These are great for sautéing things in small quantity. Mostly though, I was really impressed with the quality you get for the price that they are. Great little pan I use to precook items for a larger dish. Heats well and evenly cleans up effortlessly. Love it, but the handle does get hot. That's what pot holders are for. He’s 8 inch pans are great sometimes you don’t need the large pans of these come in handy their built well and built to last I recommend this for anyone . Fantastic pans! I use them for my egg pans. Durable and easy to clean. Price was unbelievable! Going to order a few more of these little gems! Also great for side orders of pasta, etc. Took them out of the box, washed and treated them and off we go! Love them! Great pan for the price. Big box store prices quite a bit higher. Chefs love this pan for cooking omelets. These pans hold up well and are easy to clean. This is a perfect size for scrambled eggs. This is my standard size for cooking as it is easy to move around and pick up. Very high quality and heavy duty; not lightweight. I have tried a couple of the Choice non-stick aluminum frying pans before and was impressed by their value and quality. Unfortunately, this pan seemed to be of lower quality. It had several scratches in the surface and a very difficult to remove sticker ( I needed to use a heat gun) on the cooking side. None of that was too big a deal at the price, but the pan also seemed to have issues with hot and cold spots, compared to its nonstick cousins. I bought the pan as a semi-disposable fry pan to sear in, but even with those modest goals I was a bit disappointed. This 8" aluminum fry pan is really impressive. It heats and cooks nice and easily but then cleans up even easier. The value of this pan is fantastic. These could not be more standard, and I mean that in the best way. Great, dependable, sturdy. Easy to clean. Will order more once these are on their way out. I use my 8" Aluminum Fry Pan to stir fry. I also use it to sear various seafood items and make pan gravies. Love how I can pop this pan in the oven too. Cheap and durable. I've been putting these through a lot of abuse and haven't had any significant issues with warping or anything. Anything that burns on comes right off with a solid scrub. I've only used this pan once so far, but it seems to be a good quality! It looked really burnt after frying a few grilled cheese sandwiches, but it cleaned up alright. The only thing to note is that the exposed metal handle heats up quickly, so you may want to get some type of handle cover for it. This really is a great pan. Great value. You can't get a pan this cheap any where else. Very basic, but thats perfect for me I love it so much. This really is a great pan. Great value. You can't get a pan this cheap any where else. Very basic, but thats perfect for me. for the price you pay, these pans are a tremendous deal. they are thick and heavy and hold heat well. they are also very easy to clean. they're not as "fancy" as some other stainless steel pans, but they work great. The choice 8 inch aluminum fry pan is my second favorite pan in the house. It holds temperature very well and spreads the heat evenly. I would recommend this pan to anybody looking for a great product at a great price. 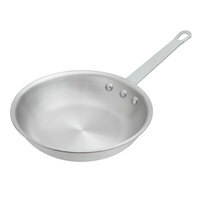 Great for normal use, the pan itself is lightweight so it makes it easy to saute in. However the heat drops very quickly due to the lightweight. These are very good aluminum fry pans. They have a nice heavy weight to them and they are easy to clean, have purchased several sizes of these fry pans. Love the size. This is for one size portion and heats up quickly. Love that its sturdy and nice. Works well with the removable sleeve and great price. I would give these pans a five star rating especially for the price but the bottoms of these pans aren't true and flat. You can set them on a solid surface and they will spin on you. Other than that a great cheap pan!!! There is no place else we have found that can match the prices and value here on pans. We have never had a disappointment, and we own a lot of them. This is a great pan for the price. Excellent pan, I've used it mainly to sear chicken, and it works like a charm. I haven't had any problem with sticking, it seems almost non stick, it has a VERY smooth finish. Solid construction. This size works best for making individual meals though. I don't use it very often because I'm generally cooking for 3-4, but on the occasions where I HAVE used it, it's worked really well. Small and light weight which makes it easy for all to use. What ever your sauteing or frying this pan will do the job and keep you going with out wearing down your arm. Easy to clean, Great price. This pan heats evenly and is very strong. I just bought the pan sleeves to help as the handle does get hot. This 8 in fry pan is an Amazing value, built to last. We use this pan for many things in our food truck. Don't miss out on this deal!!! My 1st choice of pan for small batches of Beurre Blanc , a classic sauce that needs a high quality heavy gauge pan. When making Beurre blanc , the finishing of the sauce involves whisking in cold butter, if you can use the residual heat from the pan to incorporate the butter, less chance of breaking the sauce. The heavy gauge of the 407 series pans gives plenty of residual heat. For the perfect Beurre Blanc! i was skeptical when i saw the price of these pans. but i read other reviews and thought i's give them i try. wow i think these pans are great. i make i dish where i melt cheese into crisp almost to burnt. and with just a little cooking spray the cheese comes right out. better then my non stick pans. great for sauces and sauteing and more. unbelievable pan at an unbelievable price. don't for get to include the optional removable handles. A phenomenal culinary tool! This diminutive pan packs quite a punch. It is amazingly priced with an exceptional level of quality. Product shipped quickly and was received in spectacular shape. This pan is the perfect size for sauteing a small amount of items. I've also found that it's also perfect for cooking a grilled cheese sandwich. It cleans easily and is very handy to have in the kitchen! These fry pans are not "non-stick" but I have yet to have a problem with anything sticking to it. I like them so much that I bought three.